In light of Apple's encryption fight, it's been noted the company can decrypt some data from an iCloud backup. Knowing this, security-conscious users may opt instead for locally-stored encrypted backups of their iPhone and iPad —a simple process through iTunes on both Mac and PC. 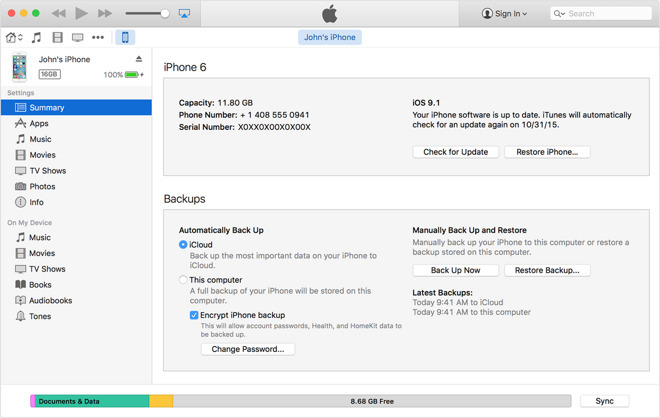 There are two ways to back up your iPhone and iPad: through iCloud, and locally through iTunes. Backing up your device using iCloud is automatic and convenient, but while the backups are always encrypted, Apple has admitted it can decrypt iPhone and iPad backups stored on its servers. This is an important distinction, because Apple cannot decrypt a passcode-protected iPhone 5s or newer, thanks to its hardware-based Secure Enclave. The only way Apple, or authorities, could potentially access a user's data is if they opt to remotely backup their device to iCloud. 1. Connect your iOS device to your Mac or PC and open iTunes. 2. Click on the device icon at the top of the screen to bring up the Summary menu. 3. Under Backups, check the "Encrypt iPhone backup" box and specify a password. Please note, there's no way to recover iTunes backups without a correct password, so be sure not to lose it. Device Summary screenshot in iTunes. Image courtesy of Apple. 4. Once the data has been backed up, go to Preferences > Devices in iTunes and look for a lock icon next to the name of the device to ensure it was encrypted. Device Preferences screenshot in iTunes. Image courtesy of Apple. In addition to added security, encrypted backups in iTunes also save data that traditional backups do not. That includes saved passwords, Wi-Fi settings, website history, and Health data. 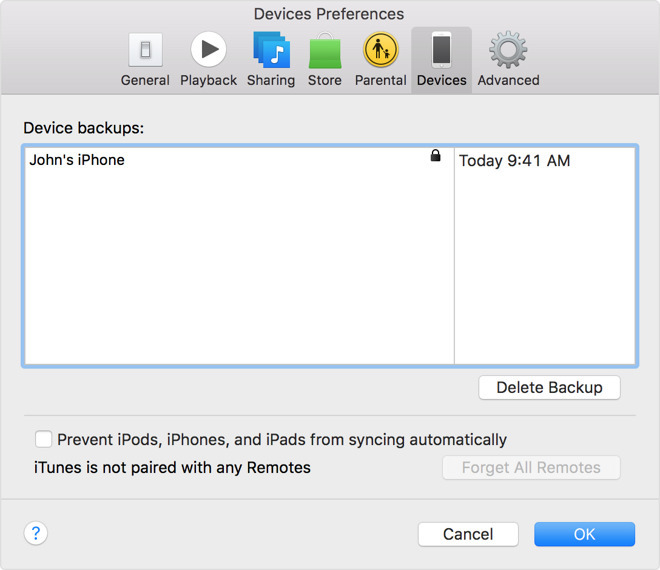 The main problem with iTunes backups is, of course, convenience —while iCloud backups can be automated nightly when charging, encrypted local backups require an iPhone or iPad to be physically connected to a Mac or PC. But for some, those extra steps may be worth the peace of mind.